You are looking at an original piece of art by alt comix legend JIM WOODRING. For apage from his new FRANK opus, CONGRESS OF THE ANIMALS. This is a beautiful page, featuring FRANK. Pen and ink on paper (10 x 14 inches), excellent condition. The back of the page features the aborted pencils to a different page from the book. A wonderful insight into Woodring's process. All kinds of great artists here. 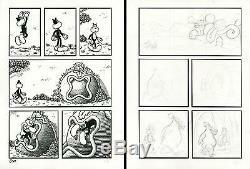 The item "JIM WOODRING Congress Of The Animals p55 ORIGINAL COMIC ART" is in sale since Thursday, May 02, 2013. This item is in the category "Collectibles\Comics\Original Comic Art\Interior Pages". The seller is "chesslove" and is located in New York, New York. This item can be shipped worldwide.